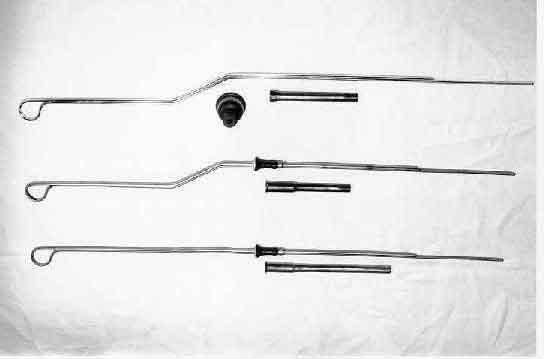 The MGB, and it's B Series engine, came with three different dip stick and dipstick tube combinations. The dipstick tube is the thing that fits into the block that guides and holds the dipstick. Early engines (18G-GF) have a screw in dipstick tube (approx 3/8 - 28 thread). These tubes are available from Moss, #451-350. Middle engines (18GH-GK?) also have a screw in tube, but it is longer with a flared end designed to retain the stick "seal" - these tubes are NOT available at the time of writing. Later engines (18V) use a press-in tube that is also available from Moss #460-035). The Moss book seems wrong in that the later tube (which they list as from 18GG thru V) WILL NOT work with the middle engine since the tube is not threaded, and is of a different length than the proper middle tube. These "middle" dip stick tubes are hard to find. And I needed one for my GJ series engine. Brian McCullogh was kind enough to look thru his bone yard and he found one. It was a major tussle to get it out. When it arrived it was a tad out of round and would not fit in my block. So I compared it to the tube I had made. Virtually the same. I had taken an early tube and brazed a piece of 3/8 stainless tubing onto it, the tubing acting as the retainer. Total length of the proper tube is 3.65", the retainer section is 1-1/2". Comparing the dipstick that came with the correct tube with the dipstick I've been using in the homemade tube (from an 18V) shows that each extends 7-1/2" from the end of the tube. With this information you should be able to concoct a usable dip stick tube for you middle-series engine if you cannot find the proper part number. Comments on "Dipstick Tubes on the MGB Engine"